The large potted palms and other plants on the terrace of the Art Café help to make this eatery especially popular in the summer. If you eat here in the evening, apart from enjoying the sunset, you can get the benefit of cool breezes while having a leisurely meal after a hot day's sightseeing. 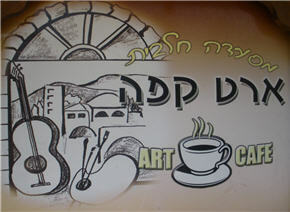 The Art Café is right next door to the Bank of Hapoalim building, set back from the road. When you come here the traffic of the Midrahov (the main street) is far enough away so that you aren't bothered by either the noise or the car fumes. Overlooking the Artists' Quarter, with views of Mount Meron across the valley to your right, on a clear night you can even see the lights of Haifa in the far distance to your left. With its level plaza the Art Café is one of the few restaurants that is not only wheelchair accessible, inside and out, but has adjacent parking. You can even catch up with your emails by using their wifi connection while you enjoy your drink or meal. The extensive menu can make it hard to choose what to have, so why not decide to share with your friends? You could try one of the popular huge salads (43shks) and follow it with a freshly cooked fish dish (65shks+) or go for the pizza (33shk+) or a pasta dish (39shks+) if you prefer. The Art Café has a wide choice of cakes (26shks+) in the chill cabinet as well as excellent ice creams and sorbets to enjoy. And don't forget about the pancakes and blintzes if you didn't try them at breakfast! Apart from the freshly squeezed juices, iced coffees and teas, the cappuccinos and hot chocolates with their lashings of whipped cream (17shks) are hard to stay away from. You can also get your coffee flavored or go for milkshakes and fruit shakes. The Art Café is very nicely decorated, and as you might expect from the name, has art on the walls. The air-conditioning also helps make it very pleasant in the heat of summer. With space for 40 inside and over 40 outside, the Art Café has plenty of room even for a large group. Prices are in the higher range for Safed. The restroom is kept clean but unfortunately isn't wheelchair accessible.